This group is of an unusually large size for an animal carving of the period. The quality of the carving and polish is nevertheless of the highest standard. The ram is a symbol of filial piety, kindness and patience. The three rams, san yang, are also an auspicious motif, related both to the sun and to male children, as they provide a rebus for san yang kai tai, the opening up of the new growth in spring, which in turn symbolises happiness and good fortune. 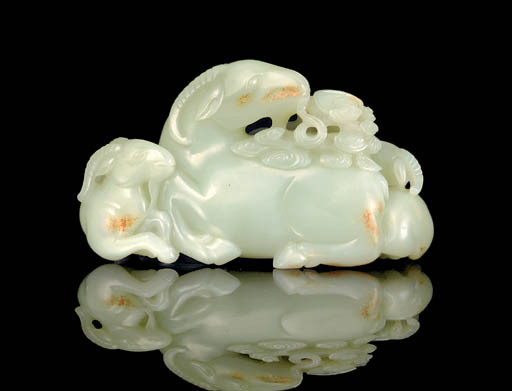 Compare with three jade groups of the three rams in the Palace Museum, Beijing, one illustrated in Jadeware (III), The Complete Collection of Treasures of the Palace Museum, Hong Kong, 1995, pl. 88 (fig. 1); and the other two smaller groups illustrated in Zhongguo Yuqi Quanji, vol. 6, pls. 269 and 307; one in the Tianjin Municipal Museum, illustrated in Cang Yu, Hong Kong, 1993, pl. 216; a group included in S. Marchant & Son's 80th Anniversary Exhibition of Chinese Jades from Han to Qing, London, 2005, Catalogue no. 74; another in the Hartman Collection, illustrated by Robert Kleiner, op. cit., pl. 194; and one sold in these Rooms, 300 Years of Jade, 30 October 2000, lot 695.